Greater Oklahoma City Chamber events are great opportunities for you to find out what is going on in your city! From informative programs and casual networking to black tie banquets and golf tournaments, Chamber events are your community connection. Celebrate the success of the Chamber and Oklahoma City! This dynamic event features exciting music and energy with a sneak peek into the upcoming year. The Annual Meeting also honors the outgoing Chamber Chairman and introduces the new Chairman. The Greater Oklahoma City Chamber is committed to keeping its members educated and motivated about current issues in and around the city. Chamber Forum luncheon topics have included Oklahoma City as a visitor's destination, Oklahoma City airports, and transportation. With more than 500 attendees, Chairman's events are held twice a year and provide an excellent opportunity to hear up-to-date information on issues impacting our region. Previous speakers included Governor Fallin, Senator Jim Inhofe, Congressman Tom Cole and Congressman James Lankford. Each year the Greater Oklahoma City Chamber takes a two-day visit to Washington, D.C. where local leaders learn more about legislation that impacts business in Greater Oklahoma City. The visit includes meetings with Oklahoma's Congressional delegation and a reception on Capitol Hill with federal officials. The annual Chamber Golf Tournaments are perfect for business and pleasure. Each tournament fields 36 four-person teams (144 players) playing a scramble format. Teams enjoy 18 holes of golf, breakfast, lunch and goody bags. This regional career fair connects more than 1,000 local students with Oklahoma businesses who are hiring interns and entry-level positions. Exhibitors network with each other and reach out to Greater Oklahoma City's best and brightest college graduates. Five Summer luncheons will motivate and educate your interns and help keep these talented future workers in Oklahoma. 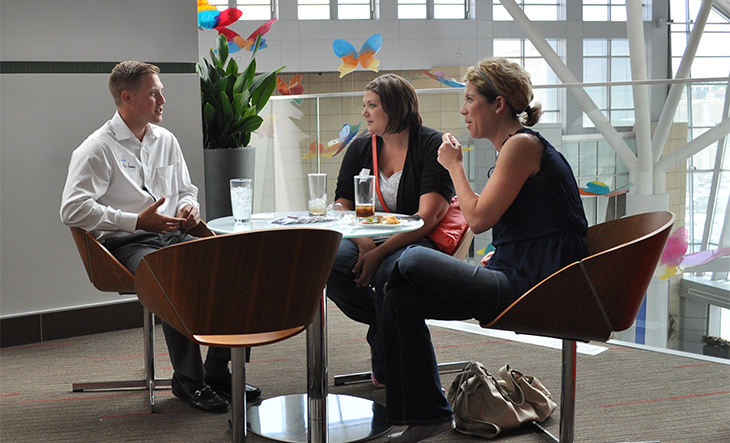 InternOKC helps interns network with peers and discover why Oklahoma City is the perfect place to live, work and play. The cost for the program is $75 per intern, which includes lunch at each session. Hear from state legislative leadership and gain important insight into the upcoming Legislative Session. The breakfast features a panel discussion that includes leadership from the majority and minority parties of both the State House and State Senate. With more than 300 in attendance, this event is a tremendous opportunity for member companies interested in state legislation to hear from lawmakers themselves. MegaLunch = MegaNetworking! MegaLunch uses a computerized rotation schedule which allows participants to promote their company to many people in a short period of time. To maximize networking opportunities for everyone, only one representative per Chamber member company may participate in each event. Attend a Member Orientation to find out more about Chamber programs and initiatives, current issues of concern for Oklahoma City as well as volunteer opportunities. Mingle with the fastest growing companies in Oklahoma City! Metro 50 is an annual awards program which recognizes and ranks the 50 fastest growing, privately-owned companies in the Oklahoma City metro area. The Greater Oklahoma City Chamber is committed to celebrating its relationship with our armed forces and their importance to our community. Navy Birthday Ball honors the camaraderie that exists between Oklahomans and the men and women of the U.S. Navy in our community. The semi-annual Rise & Shine breakfast event provides members with information about the many ways to get involved with the Chamber. It's a great way discover how to maximize membership through a wide variety of involvement opportunities. This luncheon showcases how Oklahoma City has an important and influential aerospace and defense industry. Several high-ranking officials speak about the importance of creating the best and most efficient place for our aerospace partners to do business, especially in tough budget times. This annual event gives guests the inside scoop as they hear from the Oklahoma City Mayor on what's in store for the coming year. Join more than 1,000 business leaders in an energetic, motivating and informative atmosphere. Learn about key initiatives and visions for the future of our great city. The Chamber Chairman also shares major Chamber objectives and current issues. The economy -- both locally and globally -- is constantly impacting the way we do business in Greater Oklahoma City. In order for our successes to continue, it is important to understand how current economic patterns and statistics influence day-to-day business. At the State of the Economy luncheon, national and local economists paint a picture of both the global and local economy and how our business community is being influenced by current and projected trends. This luncheon features an informative program about the state of metro area schools from elementary to higher education. With the MAPS for Kids projects in full swing, this luncheon presents an opportunity to hear directly from school leadership about the progress being made to turn the Oklahoma City Public School District into a model urban school district. Attend these monthly come-and-go receptions that include heavy hors d'oeuvres, wine and beer at a variety of host locations throughout Oklahoma City.